As humans continue to degrade and destroy our planet’s resources, leading to predictions of total ecological collapse, some (such as the entrepreneur Elon Musk) now suggest that a human colony elsewhere may be our species’ best hope for survival. 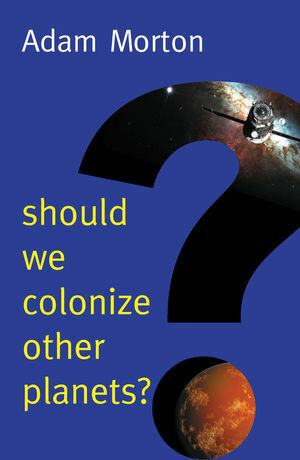 Adam Morton examines extra-terrestrial colonization plans with a critical eye. He makes a strong case for colonization – just not by human beings. Humans live relatively short lives and, to survive, require large amounts of food and water, very specific climatic conditions and an oxygen-rich atmosphere. We can create colonists that have none of these shortcomings. Reflecting compassionately on the nature of existence, Morton argues that we should treat the end of the human race in the same way that we treat our own deaths: as something sad but ultimately inevitable. The earth will perish one day, and, in the end, we should be concerned more with securing the future of intelligent beings than with the preservation of our species, which represents but a nanosecond in the history of our solar system. Adam Morton has taught at the Universities of Princeton, Bristol, and Alberta, and is now affiliated with the University of British Columbia. "Why should we value the survival of our species? Adam Morton confronts this fateful yet rarely asked question. This is a fascinating, instructive work of scientifically informed philosophy." "Adam Morton is known for turning a penetrating intellect on one after another subject that philosophers have made the mistake of neglecting."